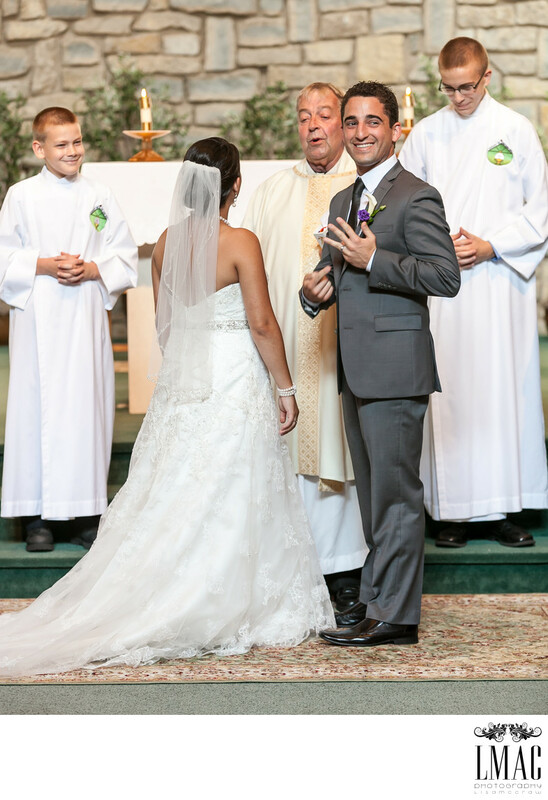 Photojournalism is such an important aspect of wedding photography. Of course beautiful wedding day portraits are important, however candid moments are equally as important because they tell the story of the wedding day. LMAC Photography specializes in the photojournalism style of wedding photography and is constantly on the hunt for these candid moments during any wedding day. This wedding day photo is one of those moments. This photo is from the wedding ceremony of Kristina and James, held at Nativity of the Lord Church in Akron, Ohio. Kristina and James also had their gorgeous wedding reception at the Sheraton Suites in Cuyahoga Falls, Ohio. There are beautiful grounds surrounding the Sheraton Suites in Cuyahoga Falls and many wedding couples select this area for bridal party and bride and groom photos.